The simplest tools are often the hardest to review. How much different can any two tape measures be? They are all basically as simple as a thin piece of metal with lines and numbers. So simple, yet, I have the hardest time finding one that I like. I have used tape measures from all of the major brands and have a good understanding of what I like and need, but none of them on the market fit the bill. Design is what makes or brakes a tape measure. It spends a lot of time in our hands being used, so any small design flaws are quickly noticed. 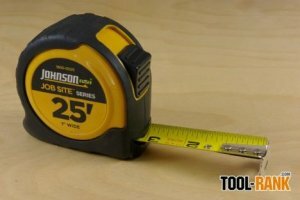 The Johnson 1805-0025 has all of the features I look for in a tape measure. The first is comfort: it is smaller then many of the tapes on the market today and thus fits well in my hands. Another thing that keeps it comfortable it its weight. It is much lighter compared to the "Fat" and similar wide type tape measures, but this also means it has a shorter tape stand-out. I was getting about 8 feet of stand-out out of the 1805-0025. This could be an issue for some people, but I usually turn to a laser if I need to measure anything in the air. The locking switch on the Johnson is also nice to use; it is nothing fancy, but it is easy to engage and holds strong. One part of the tape that could be a weakness, or a strength depending on your needs, is the larger end hook. It makes hooking easy, but for me it seemed to get caught in gaps. The look of the tape is also important, and again the Johnson 1805-0025 meets my needs. It is simple to read, not being cluttered with over-information. The tape is also nicely printed on the underside and comes in handy when measuring over-head. In fact the underside is so nicely done that I prefer it to the top face of the measure. I like the fact that the numbers are turned to the side; this makes the tape easier to read from both sides. I currently have four different 25-foot tape measures that have all fallen short, the Johnson 1805-0025 is by far my favorite.